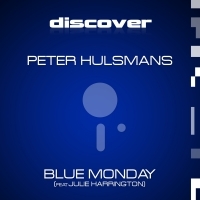 For the past few years, Peter Hulsmans has produced a steady string of quality productions for Discover to an ever increasing and appreciative fan base. He has a very unique style which is typified by a clarity and depth of sound that is often missing from todays "in the box" recordings. As much an album artist as a club producer he has been working on his debut artist album which promises much based on his recent singles. However, this superb cover version of the 1983 New Order classic "Blue Monday" is time out from the album that is very well spent!! Peter has taken his favourite club track of all time down a very different road to previous versions and he has done it with style and respect to the original. No samples here - this is a cover from the ground up but it contains much of the expected and a little of the unexpected - most notably a switch from male to female vocal. In our opinion, nobody can come close to Barney's timeless tones so the switch works on all levels. Using the word "featured" does not really do justice to the part that Julie Harrington plays in this version. Without doubt one of the most talented vocalists of our genre and beyond, her velvety vocal touch fits like a glove and is the icing on an already impressive cake. Only one question remains - How Does it Feel? 'Blue Monday' is available now from Beatport and iTunes.